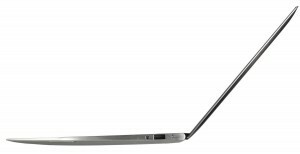 Ultra Book , Is it for you ? IT industry will always find new ways to attract its customers . When netbooks comes to the market some 4 years back , it was charming and affordable . I opted for a Asus eeePC as my prime machine instead of my heavy Dell inspiron. Even though people said that Intel atom is under powered , I did not find any issue with it and that net book is still with me running windows 7 ultimate and loaded with two virtual machines for my training division. In today’s world of tablets , a typical user who has enough money to invest on a typical net book will be lured away by the charming looks of tablets running on an ARM processor and android OS . So bad news for the win-tel platform . If you have enough money to invest on a high end laptop , mac book air may lure you with the size zero design and its charms and again bad news for the Intel range of micro processor . So the final way for Intel is seen as the ultrabooks which combine the portability of a net book , with the looks of a Mac Book . I personally think that investing on such a shiny thin piece of technology that cost like a hell is not a smart move for a person who really care about their hard earned money . Does it really matter that my laptop is few more millimeter thick ? If you just want to show off your gadget and deep pockets to purchase it , then go for it . otherwise settle on a laptop that has a real DVD drive and full sized NIC interface .